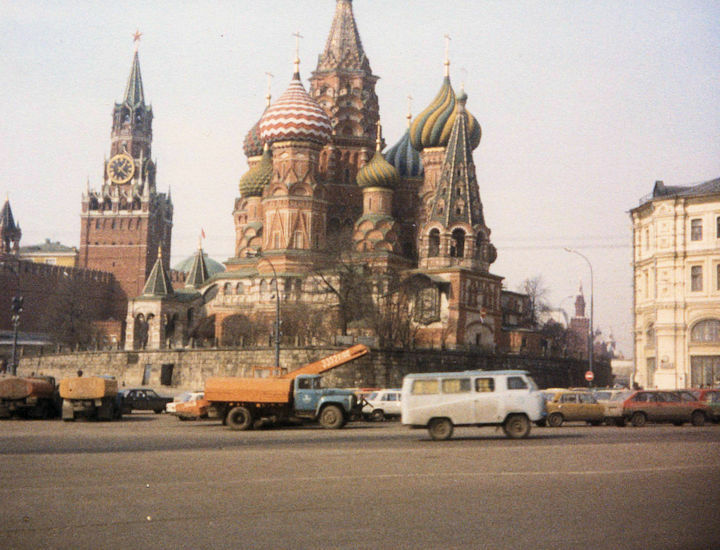 When in Moscow, always remember when taking photographs to cut off the top of iconic cathedral buildings like St Basil’s in favour of swathes of lovely, grey tarmac. I got as far as learning the 32 characters of the Cyrillic alphabet, reading some simple words like ресторан (restaurant), опера (opera) and вода (water), the question что это? (what is it?) and a few pleasantries—спасибо (please) and пожалуйста (thank you / you’re welcome). But that was it. мой багаж в метро или в такси. My luggage is on the subway or in a taxi. I would have done really well if I’d just spent my week losing my luggage on various modes of soviet transport. Over the years, I’ve had a niggling regret that I never learned more. I felt sad that I hadn’t learned more before I went (not that I would have had much opportunity to try it out) and that I had simply dropped it after I returned—admittedly to focus on noble pursuits like trying to pass my exams and get into university. I’ve regretted when hosting Russian choirs in the past that I have not been able to say much more than good morning (Доброе утро), please and thank you. 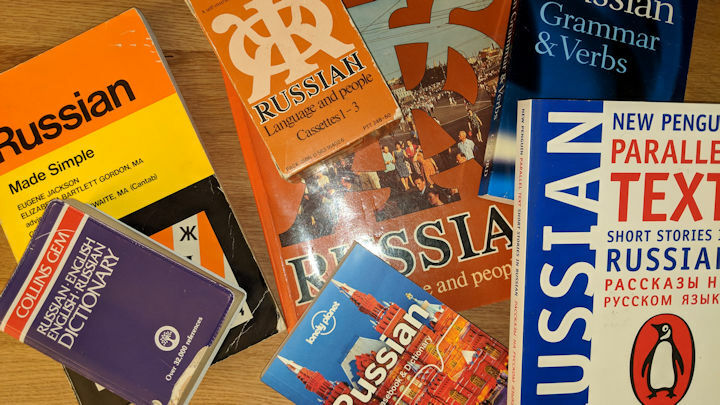 Unpacking my books a few months ago, after moving to Crail, I once again found myself stacking my few Russian language books onto a shelf and thought to myself, when is a good time to learn a new language? There isn’t one… so, I might as well just start now. So for the last 60 days I have been using Duolingo on my mobile phone to help me learn what has been described by many linguists as quite literally the language of Russia. 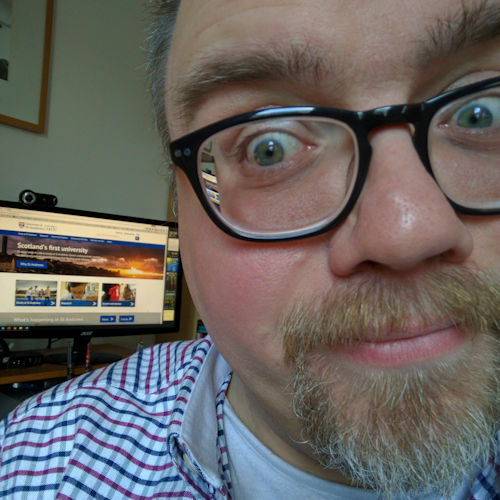 I know that if I really want to do well I am going to have to put in more than just six or seven hours a month, and hit the books to really understand the subtleties of the distinctions between ты (informal ‘you’) and вы (formal ‘you’), tenses, plurals, and all that linguistic jazz. But for now, this is giving me a gentle taster of the language and I’ve been surprised at how much I understand already after only a few minutes each day for a couple of months. And on that satirical note I will wish you до свидания! 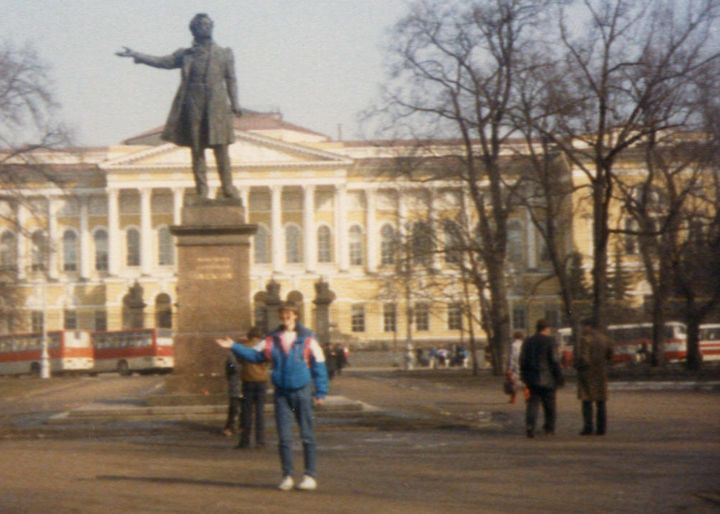 Pushkin copying what I’m doing, somewhere in Leningrad, 1988.